Pave the Way to Play! Faith School for Young Children is expanding their playground! Their new playground and naturalization area is set to break ground at the beginning of June 2016! We’re on the homestretch of our fundraising effort, but need a little help from our friends in order to reach our goal. We have raised $200,000 and have a goal of $250,000. 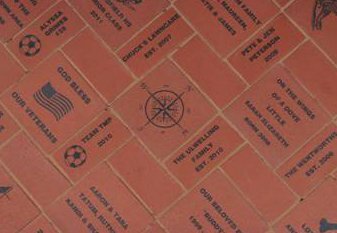 All bricks purchased will be installed outside the preschool doors and will be incorporated in a peaceful sitting area just outside the playground area so any donor will be able to locate their brick without having to enter the playground. Our playground is expanding and will include a nature playscape, garden boxes, sand boxes, hills, water play, building, art, discovery and so much more as we strive to bring learning outside! A school is the heart of a community, and a playground is the heart of a school.